Still today people enjoy living in Ilkley and visiting this healthy and pleasant place. It has beautiful scenery and a lovely location nestling in the Wharfe valley with the backdrop of Ilkley Moor. People have long lived around here. The Moors are scattered with the remains of prehistoric cairns and barrows and carved rocks from the Bronze and Iron Ages. The purpose of the rock carvings remains speculative. The local Celtic tribe – the Brigantes – used Ilkley as a crossing for the fast-flowing and fast-rising Wharfe. So when the Romans arrived about AD79 they had a ready location for a fort. At first this was timber with ramparts. As their network spread across the north of England and stabilised up to Hadrian’s Wall and beyond, it became a stone fort. A civilian settlement – the vicus – developed to the south of the fort under today’s Central Car Park. On the west side of Brook Street, where a café was built in the 1880s, they found a Roman well. It is an Italian place of refreshment today. Sometime around AD630, as at other places like Ribchester, an Anglo-Saxon church was built inside and from the stone of the fort – today’s All Saints Parish Church. After the Norman Conquest, the Angle Gammel was replaced by the De Percy family, great landowners in the north of England. In the Domesday Book Ilkley is recorded as having a church and a priest. This church continued to be at the centre of the village, developing into a Mediaeval building and altering to suit changing forms of worship. Local government was administered through the Vestry Meetings here. period – Myddelton Lodge, the home of the Lord of the Manor. During the Civil War the Middelton family – recusant Catholics – remained Royalist. Their neighbours of Denton Hall were the Fairfaxes, leading Puritans and supporters of Parliament. The only active involvement in the Civil War around Ilkley was when Prince Rupert led his army along the Wharfe to the relief of York in 1644. This event is commemorated in the name of Rupert Road. The outcome was the battle of Marston Moor, disastrous for the King’s cause. 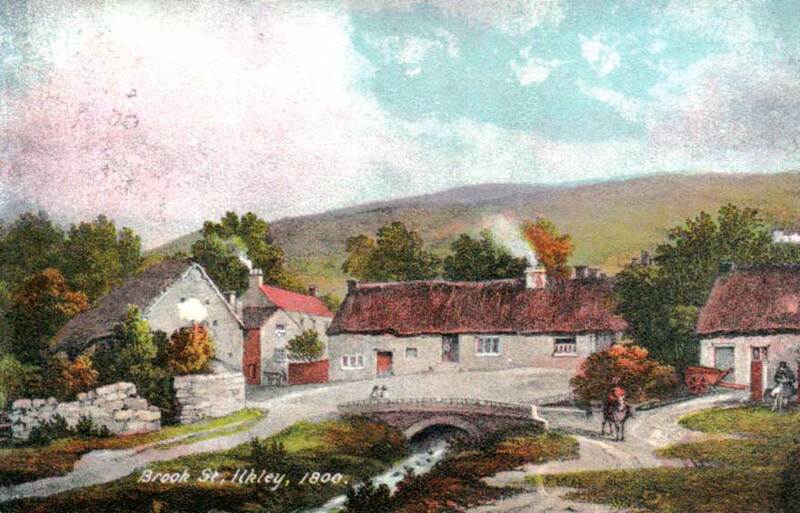 As late as the Nineteenth Century Ilkley was still a village of thatched cottages. The majority of the inhabitants were involved in farming and summer hospitality – taking advantage of the clean fresh air, pure cold water and picturesque landscape. 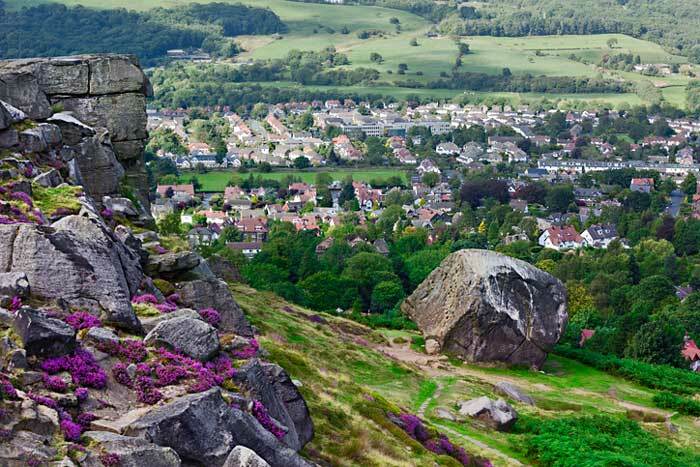 Ilkley was spared the industrialisation of nearby Addingham and Burley because the Lord of the Manor wanted to retain the rural outlook from his seat overlooking Ilkley. The Middeltons were, of course, familiar with the national spas. By the late 1700s they had built a bath house at White Wells on Ilkley Moor. William Middelton improved this to its current form around 1790. Its custodian Robert Dale advertised two new commodious baths. There were privacy walls but – until the late 1850s – no roof. There were facilities for men and women to support the two baths filled with cold water and two changing rooms where the bath attendant could give you a vigorous rub down before you redressed. Behind White Wells is a drinking fountain: part of the cold water treatment was drinking pure cold water. Donkeys could be hired to take patients up to White Wells. One now famous visitor to Ilkley in 1853 was Charlotte Bronte, when she made two short visits. When she came the stream from the moor flowed through the Corn Mill Gill still ran open down the eastern side of the street to the River Wharfe. A growing belief in the power of cold water and bathing led by the mid-1800s to the introduction of hydros. In the season people came to Ilkley for the fresh air and pure water and the chance to walk the moors. By the 1840s a former Lord Mayor of Leeds, Hamer Stansfeld, brought here what he had experienced in Central Europe. This involved immersion in cold water through baths, showers and application of cold, wet sheets. In 1843 he brought across a water cure doctor to establish a practice in Ilkley. The company he had formed built in the hamlet of Wheatley, next to Ilkley, The Wharfedale Hydropathic Establishment and Ben Rhydding Hotel, opening in 1844. As a result this part of Ilkley is known today as Ben Rhydding. Visitors often came for a month’s stay. One patient/visitor was John Bright, the Lancashire MP, who contested the Corn Laws. A group of Bradford businessmen, led by Benjamin Briggs Popplewell, acquired land on the southern slopes of Ilkley below Ilkley Moor to build the Wells House Hydro which opened in 1856. Cold water from the old White Wells spring was piped down into the cold water treatment rooms under the open terrace skating area which was later developed into a Winter Garden. Cuthbert Broderick designed the Italianate square building with an open central courtyard where visitors could take sheltered exercise. In the autumn of 1859 Charles Darwin came to stay at Wells House for a cold water treatment. He was awaiting, with some trepidation, the publication of his great book On the Origin of Species. After its success and request for a second edition he returned home feeling much better! More hydros followed, with Craiglands in 1859 built for Michael Dobson – who had been a bathman at Ben Rhydding Hydro. Dr Edmund Smith of Wells House opened the Troutbeck at the start of 1864, followed by The Grove Hydropathic towards the end of that year. The hydros were centres forwater cure. They encouraged people to go for healthy moor walks and provided landscaped grounds with walkways. The village of Ilkley was growing gradually. After the sale in 1825 of the Margerison Farm on Wells Road, Ilkley Hall was built for Joshua Dixon a solicitor in Wakefield. By the 1841 census there were more superior houses on Wells Road and off the Cow Pastures, large stone terraces in Belle Vue and Mount Pleasant. Charity Hospital on Green Lane. Today this building is part of the Abbeyfield Home. In 1865 the joint Midland & North Eastern Railway opened a station at Ilkley. This allowed visitors to come by train rather than by coach and carriage. In 1888 the railway extension opened with an iron girder bridge over Brook Street taking the trains across Ilkley to Skipton. In 1871 Bank Holidays were introduced. Now visitors could come by special excursion trains or walk over the moor from the surrounding industrial towns. William Middelton began extensive land sales in 1867 with more over subsequent years. He employed a surveyor, Joseph Smith of Bradford, to lay out wide streets to the east and west of Ilkley. Here hotels, schools and gentlemen’s villas could be built. Below the railway lines smaller houses and businesses developed in the form of terrace houses and workshops. The Brewery opened in this area in 1873. Following the land sales, the old thatched cottages started to disappear to be replaced with houses built with stone from Ilkley Moor. The release of land with the arrival of the railway meant that people could come to stay permanently in Ilkley, including businessmen from Leeds and Bradford. Up till now the only bridge across the Wharfe was that of 1675. With the local councils, the Wharfedale Estate Company saw the need for a new bridge. This facilitated land sales on the northern slopes. Ilkley remains a popular residential town. Visitors still come for a day out to experience what earlier generations came for: clean and bracing fresh air, walks on the moors, through the woods and along the river – where you will find the many sporting clubs and facilities. The long distance path – the Dalesway – starts at the old bridge. There is a wide variety of shops. 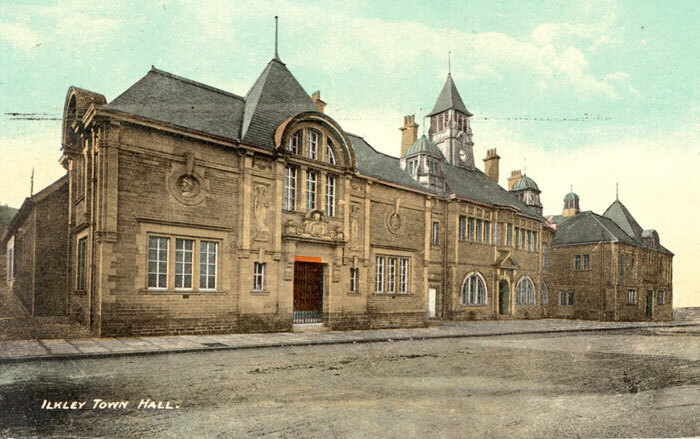 Ilkley Library, Town Hall and King’s Hall opened in 1908 opposite Ilkley Railway Station. The Winter Garden was added in 1918. You can catch a glimpse of the water cure in Ilkley Library where there is currently an exhibition about it until the start of September. At 2pm on August 12th and 19th there is a supporting talk at the Library. ALICE NUTTER: Lancashire’s first social worker?